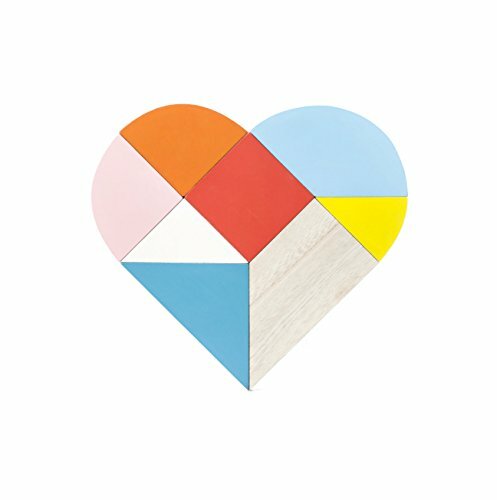 Comes together to form a heart-shaped trivet, apart they can be used as colorful coasters. Great for hosting dinners and parties. Add a piece to your kitchen and dining decor that is not only stylish but also practical with a Stonebriar cast iron trivet. 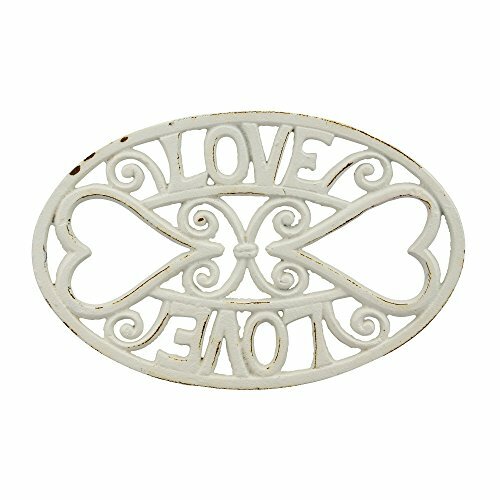 This decorative trivet features a unique love and heart design with a vintage worn white painted finish.Trivet is made from heavy duty cast iron that will last for years to come. Trivet also comes with heat resistant rubber feet to keep your counter and table tops safe and protected from pots, pans, and hot dishes while you are cooking.This unique metal trivet measures 10 inches by 6.5 inches and is the perfect size to hold tea pots, Dutch ovens, crock pots, pans, and hot dishes.When you are not using your trivet, hang it on the wall as a decorative display or place your favorite potted plant or vase on it for a unique display stand.Buy your Stonebriar cast iron trivet today and instantly enhance your kitchen and dining decor. 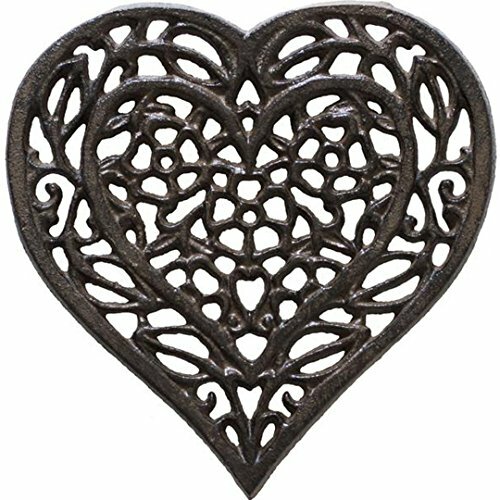 Add a piece to your kitchen and dining decor that is not only stylish but also practical with a Stonebriar heart shaped cast iron trivet. 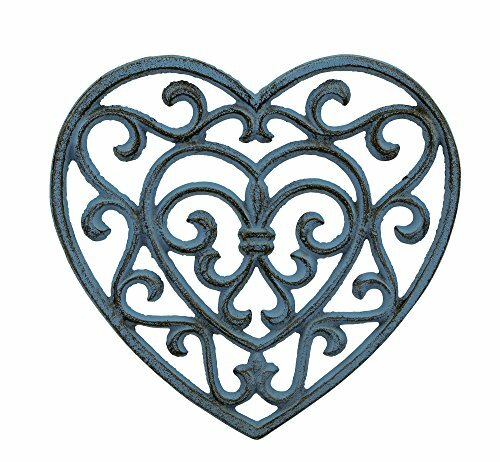 This decorative trivet features a unique scrolled heart design with a vintage worn denim blue painted finish.Trivet is made from heavy duty cast iron that will last for years to come. Trivet also comes with heat resistant rubber feet to keep your counter and table tops safe and protected from pots, pans, and hot dishes while you are cooking.This unique metal trivet measures 7.5 inches by 7 inches and is the perfect size to hold tea pots, Dutch ovens, pans, and hot dishes.When you are not using your trivet, hang it on the wall as a decorative display or place your favorite potted plant or vase on it for a unique display stand.Buy your Stonebriar heart shaped cast iron trivet today and instantly enhance your kitchen and dining decor. 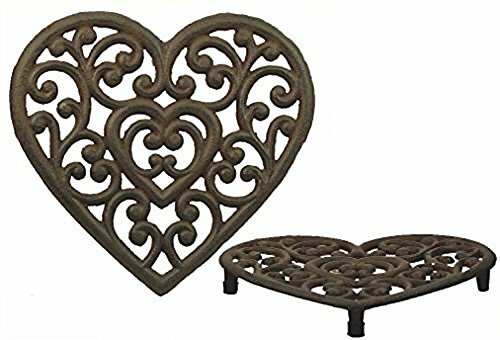 Decorative Cast Iron Trivet Ornate Heart 8"
This Cast Iron Kitchen Trivet features a Heart Shape With an Ornate Design in the middle. 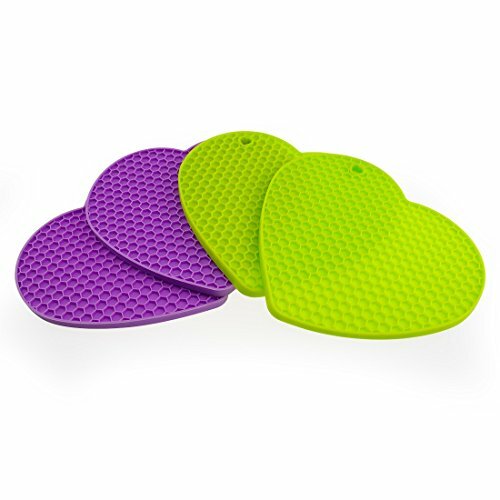 The trivet measures 8" wide and features 4 feet on bottom with rubber covers for traction on smooth tables or counters. Add decoration to your Kitchen or table while providing a place to sit hot pots or dishes at the same time. LuvlyTea - Makes Everything Better! Features • 304 grade stainless steel is rust resistant, lead and chemical free. Perfect for tea strainer and steeper. • Fine mesh traps debris and keeps your tea particle free. • Secure locking lid ensures a worry free steeping experience. • Ideal size for single cup servings. • Pack of 2 infusers, including 2 drip trays and 1 spoon. 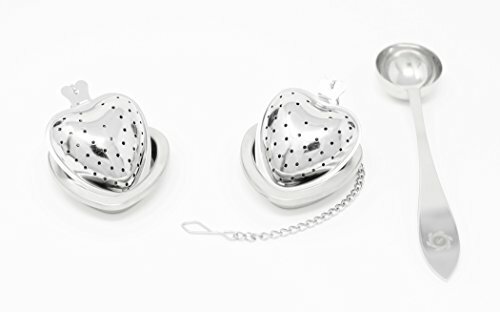 LIFE TIME WARRANTY We are confident that our LuvlyTea Infuser will provide years of worry-free use. You can buy with confidence knowing that it comes with a Lifetime Warranty, which covers any workman defects and material. Tired of stain, odor, hard to clean up? High quality and multiuse and beautiful heart shape... Mirenlife silicone insulation mats will start a different kitchen time! Premium quality: Made of high quality FDA approved 100% food-grade silicone, BPA free, non-toxic, flexible, reusable, durable, stain and odor resistant.Really save your money and help the environment. Multipurpose: Insulation performance, non-slip, suitable for kitchen table mats, bowls mat, dish mats, pot holders, coasters, table mats, etc. Also, it is thick enough to be used as a mat to protect the counter top and table, can be used as a spoon rest, can be used as a jar opener, can be used as a garlic peeler and more. Easy to wash and easy to store: Dishwasher is safe. If you like to hand wash, just use a brush and the warm soapy water. Clean up is a breeze. After washing, conveniently hang them up on nails or hooks using their built-in holes or simply roll up or flat on the table. Some instructions: 1.Before first use, please give them a "hot" bath. 2.Do not use on open flames or over a direct heat source. 3.Do not pull and impact it violently or scratch it with sharp things. DON'T WAIT ANY LONGER, SCROLL UP NOW & CLICK "ADD TO CART" TO BRING A NEW LOOK IN YOUR KITCHEN AND DINING ROOM! 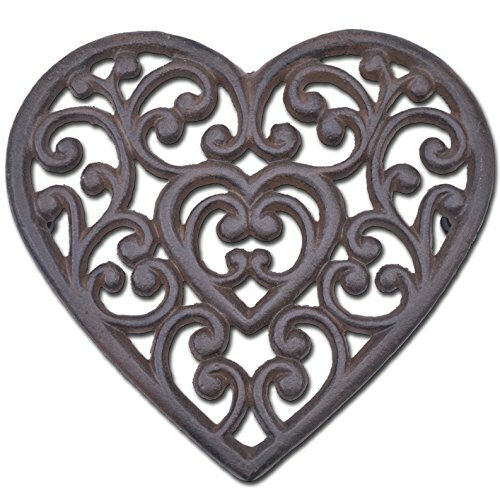 Looking for more Heart Trivet similar ideas? Try to explore these searches: Flip Flop Photo Frames, Titan Complete Body, and Platinum Fish. Look at latest related video about Heart Trivet. Shopwizion.com is the smartest way for online shopping: compare prices of leading online shops for best deals around the web. 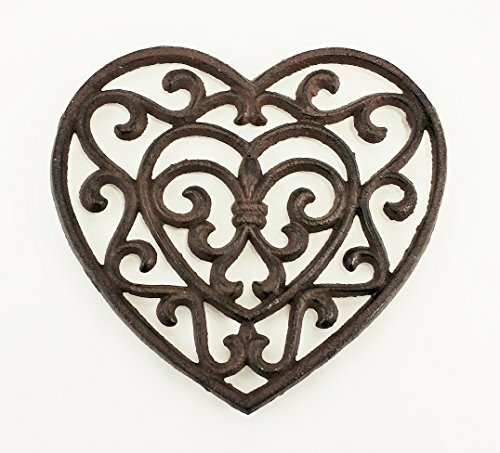 Don't miss TOP Heart Trivet deals, updated daily.